As they have for years, the students of PS 150 continued the school’s Halloween tradition on Wednesday, but this time with a wistful difference. The children gathered in costume on the steps that lead to their school building in Independence Plaza on Greenwich Street. 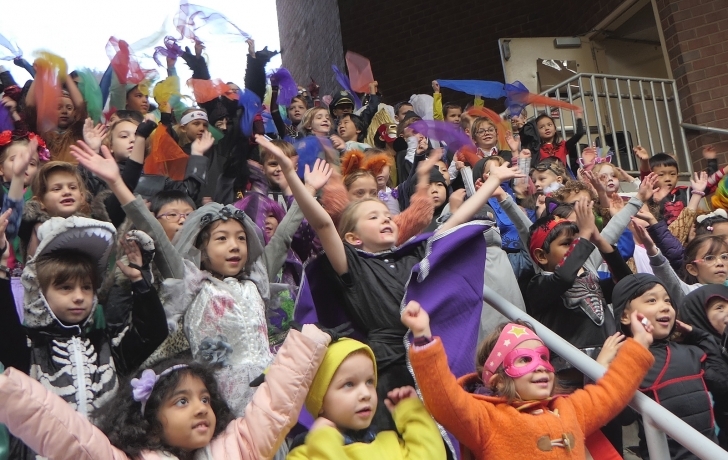 Directed by music teacher Tony Kunin, they sang a medley of Halloween-themed songs before an audience of parents, proud and beaming as ever, but keenly aware that this Halloween celebration in Tribeca may be the school’s last. Unless the owners of Independence Plaza, the school’s landlord, can be persuaded otherwise, the school community will be forced to move after this school year, “co-locating” at the Peck Slip School in the Seaport. Earlier in October, three school parents along with a slew of elected officials or their staff, and Community Board 1 vice chair Paul Hovitz, met with representatives of Vornado Realty Trust and Stellar Management, the owners of Independence Plaza. They made their case for staying put until 2022, when the school’s new building at 42 Trinity Place is expected to be completed. There was no change of heart, the parents said. “It was a meeting where Vornado and Stellar came in with their decision made,” said Anshal Purohit, the mother of a 4th grader who spoke for the parents. Among those in the room to advocate for the school were Councilwoman Margaret Chin, State Sen. Brian Kavanagh, Assemblywoman Deborah Glick, and CB1’s Paul Hovitz. Just what sort of incentive, if any, could convince the owners to change their minds remains unclear. A spokesmen for the landlords did not respond to questions from the Trib but referred to the owners’ Oct. 18 letter sent to Chin. Explaining their position on a lease extension, the owners cited uncertainty over the school’s future dating back to 2013 when the DOE had a plan, later abandoned, to move the school community to a new building in Chelsea. It also noted “the need for additional residential units and amenities” at Independence Plaza. Both factors, they said, meant that P.S. 150 would have to leave the building. The owners agreed to a three-year extension in 2015, then what they underlined as a “final” one in March 2018, allowing the school to stay one more year. It was only in early October that the SCA announced that PS 150 would be forced to leave its home at the end of the school year. The owners said they had urged the the DOE to notify the school parents long before. “We wish to emphasize that we share the frustration of the P.S. 150 community that they just learned of this relocation only two weeks ago,” the owners wrote. Whether or not that backlash is too late, a rally for the school with elected officials is being planned for the week of Nov. 12.